So you can’t tell the difference between the North Pole and the entire region above the 80 degree north latitude line? Seems like a serious cognitive disability to me. May want to get that checked out. No surprises here that the anomalous "warmth" (relative to average) continues in the high #Arctic today (>80°N latitude). For Nick — who clearly requires a lesson in scientific literacy — the above graph shows that the region above 80 N is the warmest on record for today. Looks like a perma-ban is in order. Farewell, Nick and take your misinformation elsewhere. 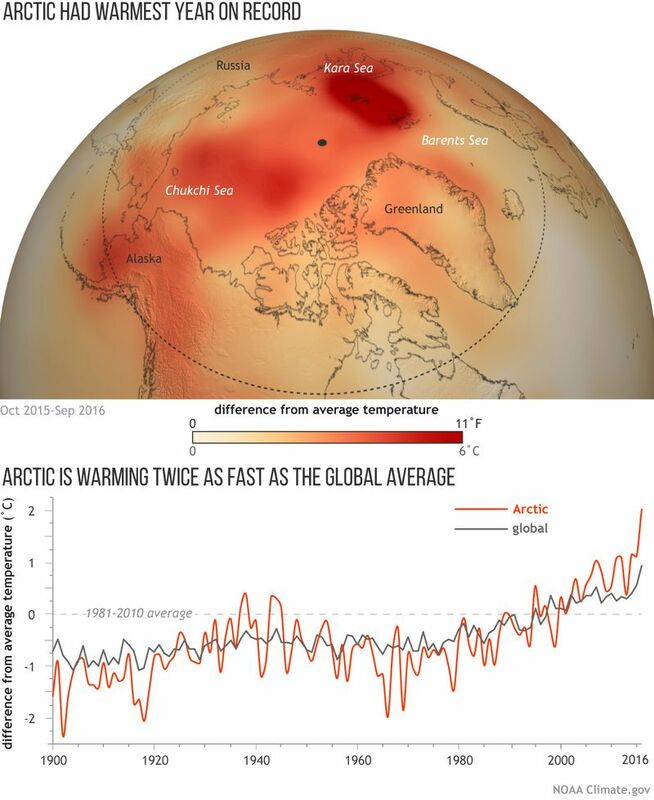 Arctic report card by NOAA shows that Arctic is warming up twice as fast as the rest of the world. That’s National Oceanic and Atmospheric Administration for the scientifically illiterate Nick. The Arctic is experiencing early problems on a large scale this year, There is no denying. Missed the first, trying again. 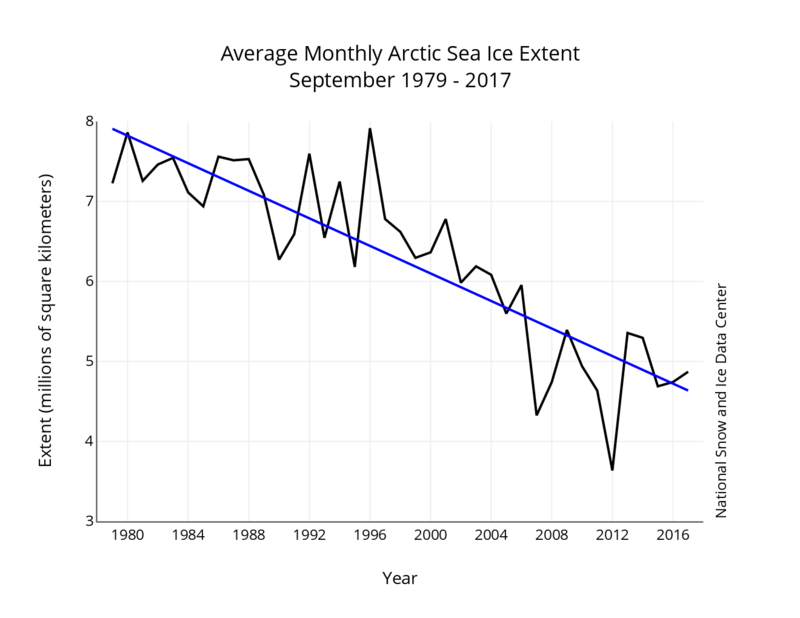 Though the actual trend has not followed a pure exponential (as depicted above), the path of significant Arctic sea ice melt is a clear one. Just stitched this same September graph onto my latest piece of arctic inspired textile art, I called it ‘Arctic meltdown’. Sorry but I cant manage to post images here! Nice! If you give me the link, I’ll see if I can post it. ASI poster wayne has a post comparing today to 1988. Interesting post depicting serious changes over past 30 years. There is not much time left for any chance of a recovery this winter. Hopefully the summer melt is not the “new normal” but rather a reduced melt, abnormally reduced melt (cloud cover or otherwise). If it is the “new normal”, then what remains of multiyear ice will get hammered, and the ocean will soak up a lot of heat degrading next winters freeze further. Some discussion on this by sea ice experts presently on the twitter feed. General conclusions are that pattern switch to cooler temps is on the way. But with the deep withdrawal of ice extending so late into season, any refreeze will tend to be thin with less snow cover than is typical. This would hint at rather reduced resiliency for spring. How that would jibe with the typical pattern for cloudier April-July periods is yet to be determined. But we do look like we’re heading toward record low or near record low sea ice Maximum in 2018 (similar to 2017 ranges at best). Of course, it’s all still highly uncertain so please take with a grain of salt. But present trends don’t look great. Please excuse my ignorance Robert but is the aforementioned cloudier April July period a ‘normal’ weather feature usually seen over the past decades? If so, is it possible that it won’t occur this year, or in the near future that the ‘new normal’ may usher in? To the contrary, cloudier April-July is a rather new feature. Likely due to increased water vapor in the Arctic. There’s a slight and probably temporary negative feedback that helps preserve sea ice during that period by reducing insolation. On net, more water vapor would also tend to increase polar amplification during fall and winter. And we would ultimately see more of a knock-on effect come summer. But the timeframe for this and even the early observations are somewhat speculative. The clear trend, however, for the past 3-4 years has been for warmer winters and somewhat cooler early summers. This has loaded the ice melt dice for winter, while somewhat retarding ice melt during the warmer months. If this happens again, it will limit damage to the summer ice. But the longer-term, overall, trend is downward. Furthermore, weather has become more of a factor during summer. In other words, any counter-trend break would be rather harmful to the summer ice considering how weakened it has become during freeze season. It is probably an unknown, not enough data, too much uncertainty to be able to forecast that with any accuracy. Thanks for the explanation. It’s one more recent large scale weather alteration and in that respect worrisome whatever it’s results. LOL. I typed some more comments on my above post then deleted them so it took a while and then i saw the comments. The situation looks bad. I am only an amateur but there is really no reason why more heat will not travel north along the same paths wrecking the last few months of ice growth which would set us up for a really bad year. Especially if some regions start with no ice at all. That means all the energy that used to be reflected is absorbed and all the energy that went into melting ice is also going into heating up the weather. If the early damage is bad enough no cloudy summer is going to help because there is just not that more to preserve. If you have been watching this since the nineties this is pretty shocking. Models were cruder, computer time was scarce compared to today and predictions were more optimistic. First serious melt would be more like 2040. Our knowledge has improved since that time and the growth in carbon emissions in the nineties was quite spectacular. 2012 was interesting and a couple of years after that started of bad but cloudy summers helped the ice. Of course it is still early 2018 but this set up looks bad. So the pattern typically changes in March/April. Or it has over the past 5 years or so. IF the present pattern remains in play later, then there will be serious trouble. But warming at the lower latitudes tends to increase T deltas between Equator and Pole during spring, which can flatten out the Jet Stream and reduce pole-ward energy transfer. Something to watch. 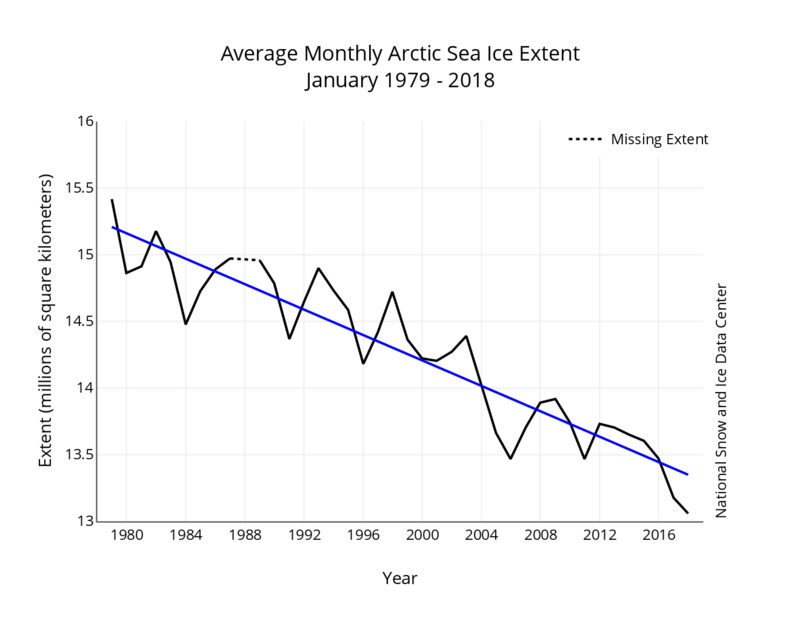 But as with last winter, this winter has been quite bad fore sea ice. Even more troubling, there is a closer to normal amount of ice in the Sea of Okhotsk and Baffin Bay. The Sea of Okhotsk has had normal to colder than normal temperatures because there have been northerly winds from Siberia. Baffin Bay has had relatively normal temperatures plus the Nares Strait has been dumping some of the oldest and thickest ice from the Arctic Basin and the Lincoln Sea into the Baffin area. Both the Sea of Okhotsk and Baffin Bay areas typically melt out during the summer melt season so normal or extra ice in these regions is not of great consequence to preserving Arctic Sea Ice. The ice in these regions also appears to be at the expense of lack of ice in the Bering Sea and along the “Atlantic Front” where the lack of ice is of much more consequence to preserving Arctic Ice. Incidentally, this has also caused colder than normal temperatures and late snowfalls in western Oregon and western Washington this month as well. When I explain the reasons for this late snowfall in this area to my friends they do at least seem interested in the reasoning. We’re just now finally getting snow in the middle of Oregon as well. Before that though we 65 and even 70 several times in January and February. I’m afraid for the summer. Winter has been sporadic both in the west and in the east. It’s probably too late for snow packs to recover out west. I fear you’re right. Fire season is gonna break records again. I hope not. But it could be rather bad considering present conditions. According to a paper published yesterday in Nature, for every 5 years we delay in addressing this problem, we could add a meter of sea level rise by 2300. Now there’s a hard limit for you! It takes a tremendous amount of heat energy to complete a phase change in solid water: 80 Calories of heat energy is necessary to melt 1-gram of ice at 0C into 1-gram of water at 0C. If you apply that same 80 Calories of heat energy to 1-gram of water at 0C, you will heat that 1-gram of water to 80C. When the ice is gone, when the phase change is complete, all that heat will go into the oceans, warming the waters rapidly. This is the scenario that is unfolding. All though this is true I suspect it doesn’t quite tell the whole story. When there was a larger volume of multi-year ice it would have a stronger cooling effect. 4+ year old ice would have a cooler core temperature than 0c and covered a much larger area just 30 years ago. We are almost out of multi-year ice floating on the ocean. That leaves most of the multi-year ice on land. These piles are being eaten into buy warmer waters underneath and warmer air above that doesn’t get the extra cooling effect from passing over or under multi-year ice. Having extent in the ball park of ” normal” summer or winter is not going to have the same cumulative effect as the old ice would. This is one factor of many that are now in play. “This is super nerdy, but a testament to the truly weird weather pattern happening today across eastern North America. 595 dm heights = unusually high even for mid-summer. This is super nerdy, but a testament to the truly weird weather pattern happening today across eastern North America. “Wow, 77° in Vermont right now. Here at NWS MHX we have blown away the records for 500MB heights the last three radiosonde releases. This morning’s 12Z run came in at an astounding 5950M, equivalent to the climo max readings in the middle of summer! Thanks for this info, Tom. Pretty ridiculous spike for February. And really an extreme swing considering where we were a few weeks ago here on the East Coast. That’s an outrageously tall high, especially for this time of year. Note the other less intense but still significant peaks over the Arctic and North American West. Climatologist Michael Mann, the director of the Earth system science center at Penn State University said the current scale could be viewed as increasingly outdated. “Scientifically, [six] would be a better description of the strength of 200mph (320km/h) storms, and it would also better communicate the well-established finding now that climate change is making the strongest storms even stronger,” he said. Thanks, I just posted a few comments on that article. Looking at the historical trend, I think we will have a Cat 6 reference eventually. And these beasts are definitely becoming more common. Today, our thoughts and prayers are with the #MAGA brigade, as they howl in despair after half their Twitter followers vanished overnight. The reason? Those ‘cruel leftist libs’ at Twitter just purged a load of Russian bots, it seems – leading (hilariously) to right-wing Tweeters losing their sh*t.
They think it’s some kind of left-wing conspiracy, whereas in fact, Twitter appears to have just deleted a bunch of non-existent fascists controlled from St Petersburg. Not seeming to realise the irony, many are sharing their agony online with the hashtag #TwitterLockout. Try not to laugh, please, now is not the time to gloat. I find it funny that for every one ‘follower’ a regular blogger/social media type loses in this long over-due action, the climate change deniers/MAGA supporters are losing ten. Kinda makes you realize how distorted social media impressions were by these bots. Also consider the impact on ‘trending’ topics. Take the time to stroll down through the comments additional information.